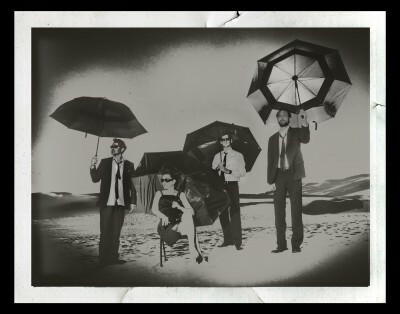 The Airborne Toxic Event: All At Once – Out Today! My god, this is excruciating! 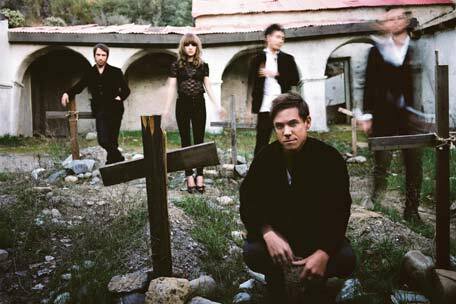 I’ve been enjoying The Airborne Toxic Event since first listening to demo tracks in 2008, and followed their steady ascent, which for me began at a downtown Boston Irish bar for about 150 people. They released their wonderful debut album on Majordomo, and proceeded to tour for the next 2-1/2 years in support of it. That album grabbed hold of my ears and wouldn’t let go, yet I now find myself approaching their follow-up, nearly three years later, with a curious mix of anticipation and trepidation. Why? Because in that time, they signed with Island Records, amassed a large audience of “casual listeners” with their radio hit, “Sometime Around Midnight,” and spent 2010 in a fancy Hollywood studio with world-renown producer Dave Sardi (Band of Horses, The Walkmen, Oasis). It made me a little nervous. This is the first time I stumbled upon a band early on, and not 10 years after everyone else, so I’m new to this whole “grappling with success” thing. I’m not sure how the band is coping, but as for myself, not terribly well. So who says a band can’t achieve huge success on its own terms? No “formula”. No concern about demographics (unless there’s a new genre called “Eastern-European-Gypsy-Mariachi-Southwestern-Desert-Polka-Pop”). DeVotchKa is deliciously uncompromising, with a wildly unique sound and globetrotting vision. What we have here is a phenomenally gifted group of musicians doing what comes naturally, with increasingly larger audiences (such as their Paris stadium show with Muse for 90,000 last year) delighting in the exotic experience. Expanding Awareness: Hypnosis. What it is. What it isn’t. On this morning’s Expanding Awareness show, Victor’s topic will be Hypnosis: What it is. What it isn’t. Tune in at 90.3FM in the Boston, area, or this show can be heard on the WZBC Archive (all of ‘ZBC’s shows are online for two weeks). Bent Wit Cabaret is part of a regular series at Club Oberon. Tickets run $10-35, and are available at www.cluboberon.com or at OBERON, 2 Arrow St., Cambridge, MA. The show starts at 8pm, and seating is limited. For their first show of the year, Bent Wit Cabaret will be examining the theme of Obsession, with a crazy cast that includes “regulars” such as co-hostesses Karin Webb and Mary Dolan, Sugar Dish (The Slutcracker), burlesque artist Femme Brulee, Lainey SchoolTree, and Bent Wit Cabaret’s house band, Elephant Tango Ensemble. The band features Valerie Thompson and Vessela Stoyanova (Goli) on vocals/cello and MIDI marimba; and Nate Greenslit (HUMANWINE, What Time Is It, Mr. Fox?) on percussion. Special features this evening will be Brian King from “What Time Is It, Mr. Fox?”, commedia antics by Behind The Mask, spoken word by Jha D, bellydance by the exotic Divine Filth and video shorts curated by the madmen at the Boston Underground Film Festival. On this morning’s Expanding Awareness show, Victor’s “encore presentation” featured James Wasserman, author of the book “The Secrets of Masonic Washington: A Guidebook to Signs, Symbols, and Ceremonies at the Origin of America’s Capital”. They discussed Freemasonry and Masonic symbols in Washington, D.C. 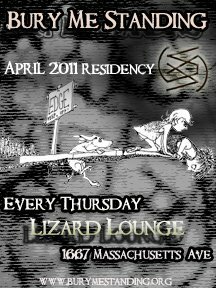 This show can be heard on the WZBC Archive (all of ‘ZBC’s shows are online for two weeks). First Show ~ TONIGHT ~ with Brian Carpenter & The Confessions and The Slomski Brothers! Beautiful and entrancing, Bury Me Standing features gypsy Balkan melodies with gorgeously flowing vocals from Bulgarian Vesela Morova, a Berklee student with a background in jazz voice and improvisation, who sings in her native tongue. Vessela Stoyanova (Goli, Fluttr Effect) performs on a very special MIDI marimba; Nate Greenslit (HUMANWINE, What Time Is It Mr. Fox and Molly Zenobia) is on percussion; Tony Leva, upright bass; and Erik James on alto sax. From marimba magic on “Jovano” (perfectly complementing Vesela’s voice), to something darker, denser, and more experimental in “Lordosis”, Bury Me Standing is mysterious and exotic, fusing diverse musical traditions – traditional Balkan, jazz, psychedelic, ambient, pop, and experimental. 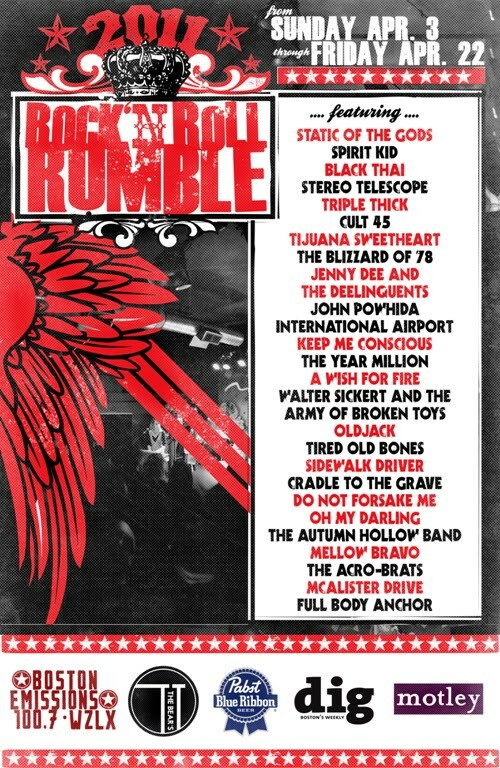 Boston’s Rock ‘n’ Roll Rumble Starts Tonight! Ok, so I’m flat out working all weekend and completely out of the loop, but for those of you wondering where all the hipsters are tonight, they’re at T.T. the Bear’s Place for the first night of the Rock ‘n’ Roll Rumble! For a full schedule of bands during this six-night extravaganza, check out Ryan’s Smashing Life. Featured bands include Jenny Dee & the Deelinquents, Walter Sickert and the Army of Broken Toys, Spirit Kid, Mellow Bravo, Do Not Forsake Me Oh My Darling, and Sidewalk Driver (and loads more). As for ‘musings’, I’m currently auditioning bands and will be doing one of my infamous ‘Band Roundups’ very soon. Promise.